Volunteers and paid construction crews have been restoring the hiking and nature trails in the Crystal Lake camp grounds. All of the hiking trails within the campground and surrounding the campground are in excellent and safe condition. TO REPORT TRAIL PROBLEMS and to get them scheduled for repair, please email us to us know what trail problems exist and we will let you know when they have been fixed -- if they can be. Photographs and possibly GPS coordinates for trail problems sent to us are a big help. Download a trail map here and then print a copy. Copies of this map are available for free at the Visitor Center though the news stand out front may be empty. Inside when the Center is open there are more. For a color map that also shows the trails, CLICK HERE and notice that there is a trail called "Wawona" which often does not appear on maps. Hawkins Ridge Trail -- This trail gets periodic maintenance done by the San Gabriel Mountains Trailbuilders, details of which you can find at this link here which describes the progress being made on the hiking trail. (Also see Dan's Hiking Blog which shows restoration efforts.) There is hope that the trail will get maintenance work done in March of 2016. Lake Trail -- Lake Trail is in great condition with the start of the trailhead having a new rock bridge built by volunteers. The trail cuts across the camp grounds and joins the main road that heads up to the Visit Center to Lake Road. The start of the trail head from the main road end is located at North 34 degrees, 19.410 by West 117 degrees, 50.261 at 5744 feet. (To see maintenance efforts of this trail, you may click here.) In March of 2014 there was some additional erosion on the trail reported however it's not serious. Golden Cup Nature Trail -- This trail has been completly restored. There was extensive flooding along this trail. This is a short hike with four or five information boards placed along the trail. The trail itself forms a loop such that the start and end of the hike is near a main paved road. The trailhead is located at North 34 degrees, 19.630 by West 117 degrees, 50.108 at 5865 feet. (To see maintenance offorts of this trail, you may click here.) Currently the start of the trail has some erosion which is scheduled to be repaired. Windy Gap -- This trail has seen considerable maintenance over the years with dead trees obstructing the trail removed, boulders blocking the trail levered over the side, and tread work being done as needed. This trail is 2.5 miles long and has its start at a paved parking lot that is North of the Visitor Center. The lower trailhead is located at North 34 degrees, 19.890 by West 117 degrees, 50.021 at 6099 feet. 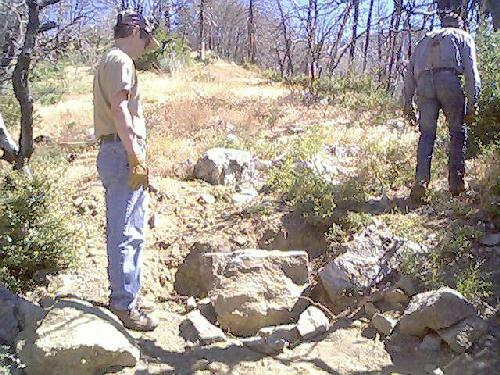 Trail maintenance efforts continue to be made every year though a number of the Sutter Walls that were installed by a contractor have been damaged due to falling trees and rock slides. Also there is one spot where rock and dirt has inundated the trail so you will have to scramble carefully across that spot. (To see maintenance of this trail, you may click here.) There is a Facebook Page For the Windy Gap Trail HERE which you should go and Like if you use Facebook. Pacific Crest Trail -- A section of the Pacific Crest Trail can be accesses from the campground by hiking up Windy Gap Trail or taking Wawona Trail up to Islip and from there to Pacific Crest Trail. From Windy Gap Saddle it is 1.4 miles to the start of Hawkins Ridge Trail, yet the condition of that 1.4 miles is not currently known. Little Jimmy Trail Camp -- The trail from Windy Gap Saddle all the way to Little Jimmy is in excellent condition. This trail is 0.3 miles long. (For information on Little Jimmy, click here.) 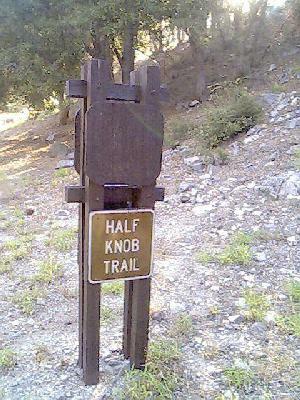 There are some missing trail signs which are scheduled to be installed. Pinyon Ridge -- This trail was fully restored during National Trails Day of 2006, and it continues to be maintained in excellent condition. This is a moderately short trail of about 1 mile which forms a loop that takes hikers up the side of the mountain ridge, along the ridge, and then back down again, curving around to form the loop. The trail head location is the same as the start of Soldier Creek: North 34 degrees, 19.354 by West 117 degrees, 49.976 at 5656 feet. (To see maintenance of this trail, you may click here.) Also there is a Facebook page HERE which you should go Like if you use Facebook. Soldier Creek Trail -- Fire damage and flooding caused significant damage to this trail and it was considered a complete loss for a number of years however the Trailbuilders and fire fighters were able to restore the trail to the point where it is once again safe to use. The trail head location is the same as the start of Pinyon Ridge trail: North 34 degrees, 19.354 by West 117 degrees, 49.976 at 5656 feet. (To see maintenance on this trail, you may clock here.) As the burned and diseased trees continue to age, tree limbs continue to fall on the trail however they are usually removed quickly after they get reported. Lost Ridge Trail -- This is another excellent hiking trail which has been fully restored by the San Gabriel Mountains Trailbuilders. This trail is just about one mile long with one end of the trailhead up near Deer Flats and the other end on Lake Road. To increase safety, the Trailbuilder crew installed steps in a number of places and the volunteers may decide to install more steps in moderately steep places in the future. 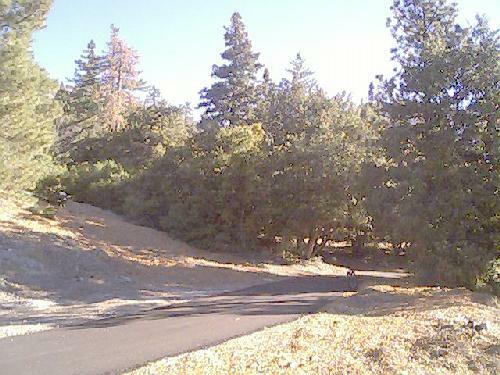 The lake road trail head is located at North 34 degrees, 19.452 by West 117 degrees, 50.463 at 5728 feet. The other end of the trail is in the Deer Flats Campgrounds and it's located at North 34 degrees, 19.977 by West 117 degrees, 50.365 at 6344 feet. In the Summer of 2011 the extensive plant growth along the way had been cut back and all of the downed trees obstructing the trail have been cleared. (To see maintenance of this trail, you may click here.) Also there is a Facebook page for the trail HERE which you should Like if you use Facebook. Tototngna Nature Trail -- A great deal of work has been performed to re-define and open-up this trail to the point where the entire loop can be hiked. This is short nature trail of 1 mile which forms a loop and can be accessed from a paved road. 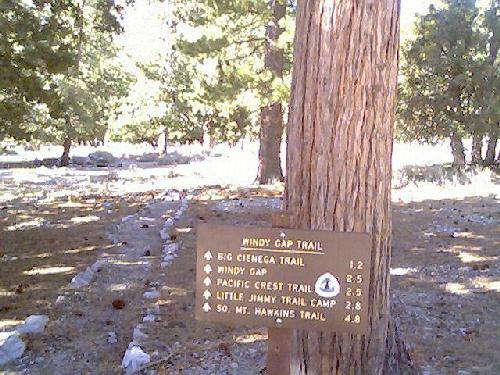 The trail head is located at North 34 degrees, 19.538 by West 117 degrees, 49.767 at 5929 feet. Becuase the trail forms a loop, the Y where the trail splits has a sign showing the way. (To see maintenance done on this trail, you may click here.) Also there is a Facebook page for the trail HERE which you should Like if you use Facebook. Sunset Ridge Nature Trail -- This trail is located inside of the Deer Flats Campgrounds. It's a short trail of about half a mile which forms a loop that ends about 30 feet from where it begins. The trail has been fully restored. The location of this trail is at North 34 degrees, 20.002 by West 117 degrees, 50.249 at 6423 feet. There is also a Facebook page for the trail HERE which you should Like if you use Facebook. Note that Sunset Ridge Trail does not show on most of the trail mails that one can find for the campground. Wawona Trail -- The trail that leads from the lake's lowest parking lot all the way up to Islip Ridge is called Wawona, and it is in good shape, having been worked on considerably in 2013. There is still some work that needs to be done up at the top of the trail with brush needing to be cut back however that may be done shortly. 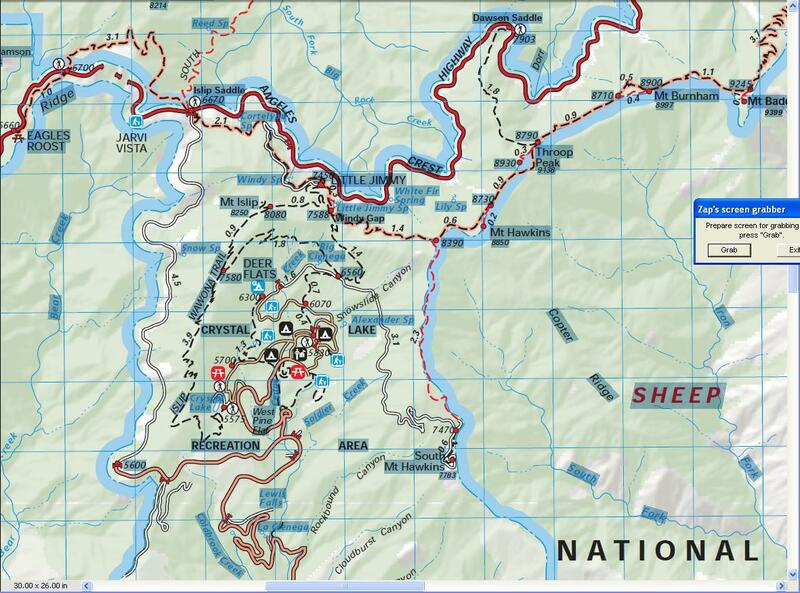 Some maps show this as Islip Trail and some maps show it as Wawona. The correct name is Wawona. During the year the Trailbuilders continue to maintain all of the hiking and nature trails within the Crystal Lake basin unless there is too much snow on the ground to make maintenance possible. In addition to the established trails, hikers can also pack water and walk up to the old Mount Saint Hawkins>fire watch tower which burned down to the ground in the last series of fires. The dirt road up to the destroyed fire tower is currently in "damaged" condition at one point where a major washout has taken place. Because the road has been officially abandoned, the condition of the road is expected to deteriorate over the coming years until much of it simply disappears.